Travelers looking for excellent quality at a great price "Stay Smart" at our Holiday Inn Express Niles, MI hotel. 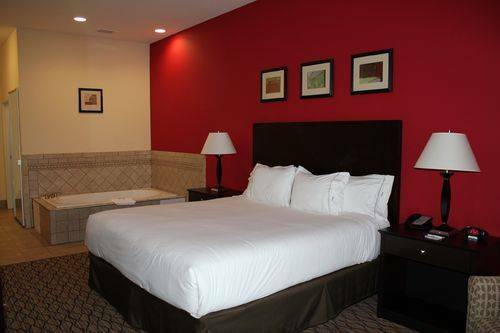 Conveniently located just 8 miles north of the University of Notre Dame and one of the largest shopping districts in Indiana, our hotel offers the best in service and convenience for business and leisure travelers. Our 100% non-smoking facilities are filled with amenities to help you unwind. Test the waters of our heated, indoor pool, or just sit back in the privacy of your own room and soak in your private whirlpool tub. Our fitness center offers you the convenience of your daily workouts, as well as the gym located next door and the city-wide running trail located directly behind the hotel. Each morning you can enjoy a complimentary deluxe hot breakfast, complete with cinnamon rolls and our very own pancake machine.Business and leisure travelers alike can utilize our complimentary WiFi or the computer in our business center to stay in touch with the office or family. Our 1100-sq-ft meeting room is ideal to host events for up to 50 attendees, whether it be a seminar or shower! Our staff is available to create a lasting experience for our guests and guests of our guests. Let us show you the unparalleled hospitality of Niles, MI. Our complimentary hot breakfast bar, features scrambled eggs omelets, sausage, biscuits and gravy, and our signature cinnamon rolls. Enjoy our 1,100 square foot meeting space perfect for business meetings, classes, small banquets, baby/bridal showers, and birthday's. Children's program - Riverfront Park - Front Street Niles Play area, movie theater, and skateboarding area. Visit one of the premiere private women's colleges in the midwest! Visit one of the premiere Adventist universities in the country! Enjoy the sights and sounds of offroad racing in one of the most popular MX tracks in the country! Visit the Studebaker National Museum and Center For History, located in the historic west side of South Bend. Experience Indiana's motoring history in this newly built facility! Get back to Nature by visiting this oasis of beauty in the picturesque woods of Michigan. There are many flora and fauna to see and experience and miles of nature trails to walk while you bird-watch. Enjoy gaming at its finest at the Four Winds Casino Resort in New Buffalo, Michigan! Slots, poker, Blackjack, and other games await you just a short drive from Niles. Open year-round, Warren Dunes State Park features nature trails, camping, boating, fishing, hunting, snowmobiling, and a fantastic beach located on the shores of Lake Michigan. Be sure to climb Tower Hill while you're there! Visit all twelve of Southwest Michigan's premiere vineyards and try a glass of the finest wine in the midwest! Check out http://www.lakemichiganshorewinetrail.com/ for more information! Built in 1892, the Niles train depot is listed on the National Registry of Historic Places. In fact, it is still working today! Stop in and see the fully restored depot and gardens. During the holidays, check out the light display! The College Football Hall of Fame features historic displays and interactive exhibits. It's a must-see for a football fan. Guided house and farm tour, horse and buggy rides, shopping, and dining family style. Plus - Broadway musical in the Round Barn Theater.